Check out Mojo Rawley’s WWE profile here! Dean Muhtadi is a former American football defensive tackle who was most recently on the NFL’s Arizona Cardinals. Muhtadi was signed by the Green Bay Packers as an undrafted free agent in 2009. Dean Muhtadi played college football for the Christopher Newport Captains, and upon transferring, for the Maryland Terrapins. In August 2012, Dean Muhtadi signed with WWE and reported to its developmental territory NXT Wrestling. Dean Muhtadi was given the ring name Mojo Rawley. April 19, 2013 – NXT Live Event: Mojo Rawley (Debut) defeated Knuckles Madsen. May 29, 2013 – NXT: Mojo Rawley made his television debut where he competed in an 18-man battle royal to determine the number one contender to the NXT Championship. He was eliminated by Mason Ryan. June 26, 2013 – NXT: Mojo Rawley defeated Knuckles Madsen in a dark match. July 19, 2013 – NXT Live Event: Mojo Rawley defeated Mike Dalton by count-out. September 5, 2013 – NXT: Mojo Rawley defeated Danny Burch in a dark match. October 9, 2013 – NXT: Mojo Rawley defeated Danny Burch. October 11, 2013 – NXT Live Event: Mojo Rawley defeated Slate Randall. November 7, 2013 – NXT: Mojo Rawley defeated Tye Dillinger. December 12, 2013 – NXT: Mojo Rawley defeated Scott Dawson w/ Sylvester Lefort. January 16, 2014 – NXT: NXT champion Bo Dallas defeated Mojo Rawley in a non-title match. April 10, 2014 – NXT: Mojo Rawley defeated Sylvester Lefort. May 1, 2014 – NXT: Mojo Rawley defeated Oliver Grey. May 8, 2014 – NXT: Mojo Rawley was in the the NXT #1 contenders battle royal won by Tyler Breeze, Sami Zayn and Tyson Kidd. May 16, 2014 – NXT Live Event: Mojo Rawley defeated Troy McClain. May 17, 2014 – NXT Live Event: Mojo Rawley defeated Tyler Breeze. May 29, 2014 – NXT: there was a segment between Rusev and Lana. Mojo Rawley came in and got destroyed by Rusev. June 19, 2014 – NXT: Mojo Rawley defeated Garrett Dylan. July 24, 2014 – NXT: Tyler Breeze defeated Mojo Rawley. August 21, 2014 – NXT Live Event: Mojo Rawley defeated Sawyer Fulton. October 9, 2014 – NXT: Tyler Breeze defeated Mojo Rawley. May 29, 2015 – NXT Live Event: Mojo Rawley defeated Sawyer Fulton. June 5, 2015 – NXT Live Event: Mojo Rawley defeated Marcus Louis. June 10, 2015 – NXT: Mojo Rawley and Zack Ryder defeated Mike Rawlis and Elias Sampson. June 13, 2015 – NXT Live Event: NXT tag team champions Blake and Murphy defeated Zack Ryder and Mojo Rawley to retain the titles. June 19-20, 2015 – NXT Live Event: The Hype Bros (Zack Ryder and Mojo Rawley) defeated Dash Wilder and Scott Dawson. June 24, 2015 – NXT: The Hype Bros (Zack Ryder and Mojo Rawley) defeated Angelo Dawkins and Sawyer Fulton. June 26-27, 2015 – NXT Live Event: The Hype Bros (Zack Ryder and Mojo Rawley) defeated Dash Wilder and Scott Dawson. July 11, 2015 – NXT Live Event: Dash Wilder, Scott Dawson and Mike Rawlis defeated Mojo Rawley, Zack Ryder and Steve Cutler. July 17, 2015 – NXT Live Event: Mojo Rawley and Zack Ryder defeated Chad Gable and Jason Jordan. July 23, 31, 2015 – NXT Live Event: Mojo Rawley defeated Axel Tischer. August 6, 2015 – NXT Live Event: Mojo Rawley defeated Sawyer Fulton. August 5, 2015 – NXT: Mojo Rawley and Scott Dawson defeated Dash Wilder and Scott Dawson. August 19, 2015 – NXT: Mojo Rawley, Zack Ryder, Enzo Amore and Colin Cassidy defeated ?? ?, Aaron Solo, Jesse Sorensen and Jesus De Leon. August 26, 2015 – NXT: Mojo Rawley, Zack Ryder, Enzo Amore and Colin Cassidy defeated Chad Gable, Dash Wilder, Jason Jordan and Chad Gable. September 3, 2015 – NXT Live Event: Mojo Rawley and Zack Ryder defeated Alexander Wolfe and Noah Kekoa in the 1st round of the Dusty Rhodes tag team tournament. September 4, 2015 – NXT Live Event: Mojo Rawley, Zack Ryder, Enzo Amore and Colin Cassidy defeated Chad Gable, Dash Wilder, Jason Jordan and Chad Gable. September 16, 2015 – NXT: Mojo Rawley and Zack Ryder defeated Riddick Moss and Elias Samson in a dark match. September 25, 2015 – NXT Live Event: Dash Wilder and Scott Dawson defeated Mojo Rawley and Zack Ryder. September 26, 2015 – NXT Live Event: Chad Gable and Jason Jordan defeated Mojo Rawley and Zack Ryder in the quarter-finals of the Dusty Rhodes tag team tournament. October 14, 2015 – NXT: Mojo Rawley was in the #1 contenders battle royal for the NXT title won by Apollo Crews. October 16, 2015 – NXT Live Event: NXT tag team champions The Vaudevillains defeated Blake and Murphy, Chad Gable and Jason Jordan & Mojo Rawley and Zack Ryder in a 4-way to retain the titles. October 17, 2015 – NXT Live Event: Mojo Rawley and Zack Ryder defeated Marcus Louis and Tucker Knight. November 5, 2015 – WrestleMania 31 Pre Sale Party: The Hype Bros (Mojo Rawley and Zack Ryder) defeated Blake and Murphy. November 7, 2015 – Live Event: Sawyer Fulton defeated Mojo Rawley. November 13, 2015 – Live Event: Mojo Rawley defeated Angelo Dawkins. November 14, 2015 – Live Event: Mojo Rawley defeated Elias Samson. December 4-5, 2015 – WWE Live Event: The Hype Bros (Mojo Rawley and Zack Ryder) defeated Adam Rose and Bo Dallas. December 6, 2015 – WWE Live Event: The Hype Bros (Mojo Rawley and Zack Ryder) defeated Adam Rose and Stardust. December 23, 2015 – NXT: Chad Gable and Jason Jordan defeated Blake and Murphy w Alexa Bliss, The Hype Bros (Mojo Rawley and Zack Ryder) & The Vaudevillains in a 4-way tag team match. December 29, 2015 – WWE Live Event: The Hype Bros (Mojo Rawley and Zack Ryder) defeated The Ascension (Konnor and Viktor). December 30, 2015 – Live Event: The Hype Bros (Mojo Rawley & Zack Ryder) & Titus O’Neil defeated The Cosmic Wasteland (Konnor, Stardust & Viktor). January 8, 2016 – NXT Live Event: The Hype Bros (Mojo Rawley and Zack Ryder) defeated Marcus Louis and Sawyer Fulton. January 9, 2016 – NXT Live Event: Mojo Rawley and Zack Ryder defeated Hugo Knox and Tucker Knight & Blake and Murphy in a 3-way tag team match. January 29, 2016 – NXT Live Event: The Hype Bros (Mojo Rawley and Zack Ryder) defeated Blake and Murphy. January 30-31, 2016 – WWE Live Event: The Hype Bros (Mojo Rawley and Zack Ryder) defeated Los Matadores (Diego and Fernando). February 5, 2016 – Main Event: The Hype Bros (Mojo Rawley and Zack Ryder) defeated The Dudley Boyz (Bubba Ray Dudley and D-Von Dudley) in a dark match. February 11, 2016 – NXT Live Event: The Hype Bros (Mojo Rawley and Zack Ryder) defeated Blake and Murphy. February 12, 2016 – NXT Live Event: The Hype Bros (Mojo Rawley and Zack Ryder) defeated Gzim Selmani and Sunny Dhinsa. February 26-27, 2016 – NXT Live Event: Mojo Rawley defeated Alexander Wolfe. March 4-5, 2016 – NXT Live Event: The Hype Bros (Mojo Rawley and Zack Ryder) defeated Alexander Wolfe and Sawyer Fulton. March 10-11, 2016 – NXT Live Event: Mojo Raley defeated Alex Riley. March 12, 2016 – NXT Live Event: Mojo Rawley defeated Josh Woods. March 19, 2016 – NXT Live Event: Mojo Rawley defeated Sawyer Fulton. March 26, 2016 – Live Event: The Hype Bros (Mojo Rawley and Zack Ryder) defeated The Ascension (Konnor and Viktor). April 27, 2016 – NXT: The Hype Bros (Mojo Rawley and Zack Ryder) defeated Blake and Murphy. May 7-8, 2016 – Live Event: The Hype Bros (Mojo Rawley and Zack Ryder) defeated The Social Outcasts (Bo Dallas and Curtis Axel). May 12, 2016 – NXT Live Event: Austin Aries defeated Mojo Rawley. May 14, 2016 – NXT Live Event: Austin Aries defeated Mojo Rawley. May 27-29, 2016 – Live Event: The Club (Karl Anderson and Luke Gallows) defeated The Hype Bros (Mojo Rawley and Zack Ryder). June 2, 2016 – NXT Live Event: Alexander Wolfe and Sawyer Fulton defeated Hugo Knox and Mojo Rawley. June 4, 2016 – NXT Live Event: Hugo Knox and Mojo Rawley defeated Sawyer Fulton and Alexander Wolfe. June 23, 2016 – NXT Live Event: Mojo Rawley defeated Josh Woods. June 30, 2016 – NXT Live Event: Austin Aries defeated Mojo Rawley. July 16, 2016 – NXT Live Event: Mojo Rawley defeated Buddy Murphy. July 23, 2016 – NXT Live Event: Mojo Rawley defeated Josh Woods. July 24, 2016 – WWE Battleground: WWE United States champion Rusev w Lana defeated Zack Ryder to retain the title. Mojo Rawley confronted Rusev after the match. August 4, 2016 – Main Event: The Hype Bros (Mojo Rawley and Zack Ryder) defeated The Ascension (Konnor and Viktor). August 4, 2016 – NXT Live Event: Austin Aries defeated Mojo Rawley. August 6, 2016 – NXT Live Event: Austin Aries defeated Mojo Rawley. August 27-28, 2016 – Live Event: The Hype Bros (Mojo Rawley and Zack Ryder) defeated Breezango (Fandango and Tyler Breeze). September 11, 2016 – Backlash: The Usos (Jey Uso and Jimmy Uso) defeated The Hype Bros (Mojo Rawley and Zack Ryder) in the semi-finals. September 12, 2016 – Live Event: Jason Jordan & The Hype Bros (Mojo Rawley & Zack Ryder) defeated Konnor & The Vaudevillains (Aiden English & Simon Gotch). September 17-19, 24, 2016 – Live Event: The Hype Bros (Mojo Rawley and Zack Ryder) defeated The Ascension (Konnor and Viktor). September 26, 2016 – Live Event: American Alpha (Chad Gable & Jason Jordan) & The Hype Bros (Mojo Rawley & Zack Ryder) defeated Breezango (Fandango & Tyler Breeze) & The Ascension (Konnor & Viktor). October 1-3, 2016 – Live Event: American Alpha (Chad Gable & Jason Jordan) & The Hype Bros (Mojo Rawley & Zack Ryder) defeated Breezango (Fandango & Tyler Breeze) & The Ascension (Konnor & Viktor). October 15-16, 2016 – Live Event: Heath Slater & The Hype Bros (Mojo Rawley & Zack Ryder) defeated Simon Gotch & The Ascension (Konnor & Viktor). October 17, 2016 – Live Event: Heath Slater & The Hype Bros (Mojo Rawley & Zack Ryder) defeat Konnor & The Vaudevillains (Aiden English & Simon Gotch). October 25, 2016 – SmackDown Live: The Hype Bros (Mojo Rawley and Zack Ryder) defeated The Ascension (Konnor and Viktor). November 3, 5-7, 2016 – Live Event: The Hype Bros (Mojo Rawley and Zack Ryder) defeated The Ascension (Konnor and Viktor). December 6, 2016 – SmackDown Live: The Hype Bros (Mojo Rawley and Zack Ryder) defeated The Ascension (Konnor and Viktor). December 13, 2016 – SmackDown Live: The Hype Bros (Mojo Rawley & Zack Ryder) defeated The Ascension (Konnor & Viktor) and Breezango (Fandango & Tyler Breeze) and American Alpha (Chad Gable & Jason Jordan) and The Vaudevillains (Aiden English & Simon Gotch) and Heath Slater & Rhyno in a battle royal to become #1 contenders for the tag team titles. Zack Ryder got injured during the match and is out for 4-9 months. January 30, 2017 – Royal Rumble: Mojo Rawley was in the Royal Rumble match won by Randy Orton. February 5, 2017 – Live Event: Mojo Rawley defeated Aiden English. February 11, 2017 – Live Event: Mojo Rawley defeated Konnor. February 13, 2017 – Live Event: Mojo Rawley defeated Konnor. February 18-19, 2017 – Live Event: Mojo Rawley defeated Aiden English. February 20, 2017 – Live Event: Heath Slater, Mojo Rawley and Rhyno defeated Aiden English & The Ascension (Konnor and Viktor). March 11, 2017 – Live Event: Heath Slater, Mojo Rawley and Rhyno defeated Breezango (Fandango & Tyler Breeze) and Curt Hawkins. March 18, 20, 2017 – Live Event: Mojo Rawley defeated Konnor. March 19, 2017 – Live Event: Mojo Rawley defeated Viktor. March 25-27, 2017 – Live Event: Apollo Crews, Heath Slater, Mojo Rawley and Rhyno defeated Breezango (Fandango & Tyler Breeze) & The Vaudevillains (Aiden English and Simon Gotch). May 1, 5-8, 2017 – Live Event: Mojo Rawley defeated Aiden English. May 27-29, 2017 – Live Event: Mojo Rawley defeated Aiden English. June 3-5, 2017 – Live Event: Mojo Rawley and Sin Cara defeated The Ascension (Konnor and Viktor). June 13, 2017 – SmackDown Live: Zack Ryder returned and said he and Mojo Rawley had unfinished business as a tag team. June 26, 2017 – Live Event: Rusev defeated Mojo Rawley. July 4, 2017 – SmackDown Live: Mojo Rawley was in the #1 contenders battle royal for the United States title won by AJ Styles. July 18, 2017 – SmackDown Live: The Hype Bros (Mojo Rawley and Zack Ryder) defeated The Ascension (Konnor and Viktor) in a dark match. July 25, 2017 – SmackDown Live: The Hype Bros (Mojo Rawley and Zack Ryder) defeated The Ascension (Konnor and Viktor) in a dark match. September 2-4, 2017 – Live Event: Sami Zayn & The Hype Bros (Mojo Rawley and Zack Ryder) defeated Erick Rowan & The Ascension (Konnor and Viktor). September 12, 2017 – SmackDown Live: Chad Gable and Shelton Benjamin defeated The Hype Bros (Mojo Rawley and Zack Ryder). Zack Ryder walked away from Mojo Rawley after the match. September 19, 2017 – SmackDown Live: WWE tag team champions The New Day (Big E and Kofi Kingston) defeated The Hype Bros (Mojo Rawley and Zack Ryder) in a non-title match. October 1-2, 2017 – Live Event: Luke Harper & The Hype Bros (Mojo Rawley and Zack Ryder) defeated Erick Rowan & The Ascension (Konnor and Viktor). October 16, 2017 – Live Event: Breezango (Fandango and Tyler Breeze) defeated The Colons (Epico Colon and Primo Colon) & The Hype Bros (Mojo Rawley and Zack Ryder) in a 3-way tag team match. November 21, 2017 – SmackDown Live: The Bludgeon Brothers (Harper and Rowan) defeated The Hype Bros (Mojo Rawley and Zack Ryder). November 28, 2017 – SmackDown Live: The Bludgeon Brothers (Harper and Rowan) defeated The Hype Bros (Mojo Rawley and Zack Ryder). Mojo Rawley attacked Zack Ryder after the match signaling the end of the Hype Bros.
December 17, 2017 – Clash Of The Champions Kickoff: Mojo Rawley defeated Zack Ryder. December 30, 2017 – Live Event: Mojo Rawley defeated Zack Ryder. January 6-7, 2018 – Live Event: Mojo Rawley defeated Sin Cara. January 9, 2018 – SmackDown Live: Mojo Rawley defeated Zack Ryder in the 1st round of the United States title tournament. January 16, 2018 – SmackDown Live: Bobby Roode defeated Mojo Rawley in the semi-finals of the United States title tournament. January 27, 2018 – Live Event: Zack Ryder defeated Mojo Rawley. April 8, 2018 – WrestleMania 34 Kickoff: Mojo Rawley was in the Andre The Giant Memorial battle royal won by Matt Hardy. April 16, 2018 – RAW: Mojo Rawley was part of the superstars shake up and is now a member of Monday Night RAW. April 27, 2018 – Greatest Royal Rumble: Mojo Rawley entered the Royal Rumble match at #29 but was won by Braun Strowman. May 18, 2018 – Main Event: Mojo Rawley defeated Chad Gable. May 26, 2018 – Main Event: Apollo Crews w Titus Worldwide defeated Mojo Rawley. June 1-2, 8-10, 2018 – Live Event: Bobby Roode defeated Mojo Rawley. June 15-16, 2018 – Live Event: Zack Ryder defeated Mojo Rawley by disqualification. Chad Gable, Goldust and Zack Ryder defeated Curt Hawkins, Mike Kanellis and Mojo Rawley. June 29-30, 2018 – Live Event: Matt Hardy defeated Mojo Rawley. July 16, 2018 – RAW: Mojo Rawley defeated Tyler Breeze. July 23, 2018 – RAW: Mojo Rawley defeated Tyler Breeze. August 6, 2018 – RAW: Mojo Rawley defeated No Way Jose. August 24, 2018 – Main Event: Mojo Rawley defeated Rhyno. September 6, 2018 – Main Event: Mojo Rawley defeated Zack Ryder. September 21, 2018 – Live Event: Mojo Rawley defeated Tyler Breeze. October 5, 2018 – Main Event: Tyler Breeze defeated Mojo Rawley. October 12, 2018 – Main Event: Zack Ryder defeated Mojo Rawley. October 12, 2018 – Live Event: Tyler Breeze defeated Mojo Rawley. October 14, 2018 – Live Event: Tyler Breeze defeated Mojo Rawley. Apollo Crews defeated Mojo Rawley. November 9, 2018 – Main Event: Tyler Breeze defeated Mojo Rawley. November 30, 2018 – Main Event: Titus O’Neil defeated Mojo Rawley. December 7, 2018 – Main Event: The B-Team (Bo Dallas & Curtis Axel) and Zack Ryder defeated The Ascension (Konnor & Viktor) and Mojo Rawley. December 14, 2018 – Main Event: Tyler Breeze defeated Mojo Rawley. December 17, 2018 – RAW: Zack Ryder defeated Mojo Rawley in a dark match. December 31, 2018 – RAW: Mojo Rawley was in the #1 contender battle royal for the Intercontinental title won by Apollo Crews. February 15-16, 22-24, 2019 – Live Event: Mojo Rawley defeated Tyler Breeze. 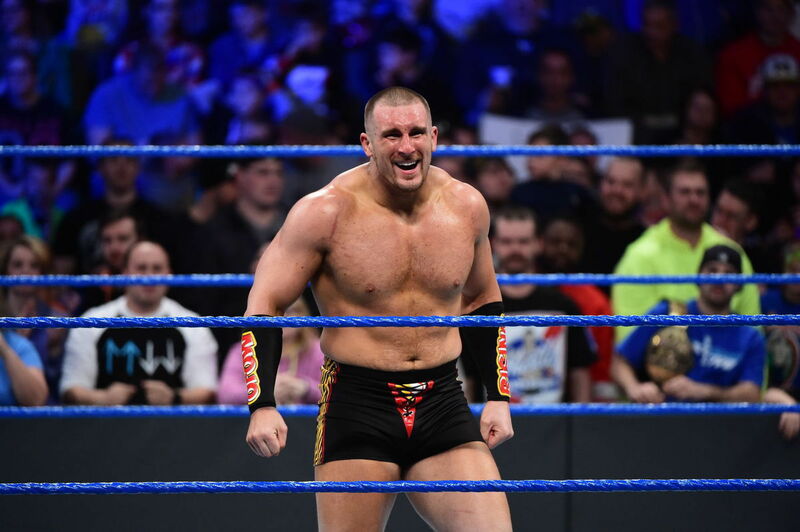 March 8, 2019 – Live Event: Mojo Rawley defeated Tyler Breeze. March 9, 2019 – Live Event: Harper defeated Mojo Rawley. Currently on @HBO: the 69th episode of @GameOfThrones. Guaranteed to be spectacular.